Happy Deepavali to all my relatives, friends and my fellow bloggers. One of the big festivals celebrated widely throughout India, is on 26th October this year.Festival of lights popularly known as Naraka Chaturdasi in south India is on 26th October, followed by Amavasya which is auspicious for the Laxmi Puja to be performed in the evening of the Amavasya during pradosh kaal every year, is also on 26th October. Dantaras or Dana Thriyodasa is on 24th October. The "Ganga Snanam' marks the importance in Deepavali for south Indians. The sacred oil bath is taken in the early hours when Chaturdasi thithi prevails. This year the chaturdasi is upto 3.50AM (IST) and 4.44AM(PST). Within India there is difference in Sun rise time in each state. The Sunrise in Chennai is earlier by 11minutes when compared to Hyderabad. So the Chaturdasi is upto 3.39 AM in Chennai. The Thriyodasa thithi is from 9.32AM on 24th October till 7.14AM on 25th October. Purchase of Gold, Silver during this time is considered to bring prosperity and puja is performed in all the shops. 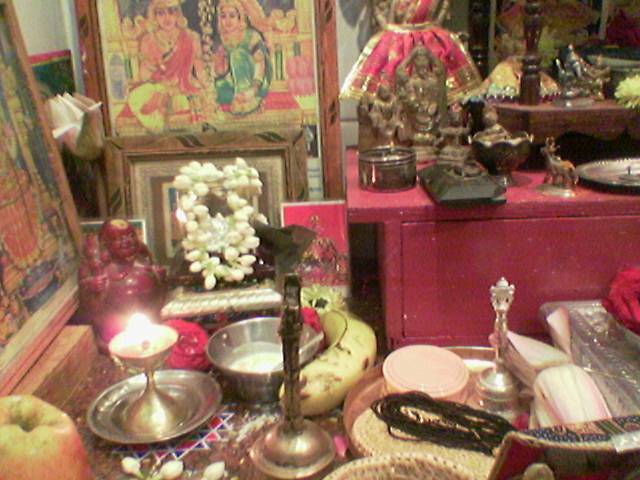 The Laxmi Puja performed on Deepavali day in homes and shops is based on the Pradosh Kaal and the apt Muhurth/Muhurtham is fixed. This year the Muhurth is during 5.48pm to 8.12pm (IST - in Hyderabad). It is auspicious to perform Ganesh, Laxmi and Kubera puja during the stable Taurus Muhurtham which is from 5.56pm to 7.51pm (IST -in Hyderabad) The sunset is 3 minutes earlier in Chennai. So the muhurtham starts at 5.45pm to 8.09pm. The muhurtham is from 6.07pm to 8.31pm (PST) as per sunset in Western parts of USA. The Nishith Kaal muhurth is auspicious to recite stotras and mantras for Godess laxmi which is from 8.13pm to 10.37pm (IST), that is, next 2hrs and 24min after Padosh Kaal. Sri Sukhtam and Sri Sthuti should be recited. 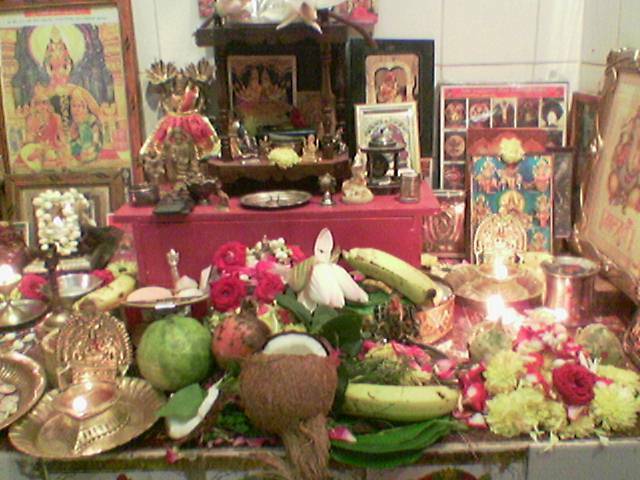 The Laxmi puja can be performed following the procedure given in many sites in English and tamil audio too. Kubera puja when done along with laxmi puja is preferred. Since it is festival of lights. Puja to vilakku can be done chanting Laxmi Ashtotharam with kumkum. Kubera will be pleased if a simple prasadam is offered like Panchambridham. Rose flower can be used for pujai. 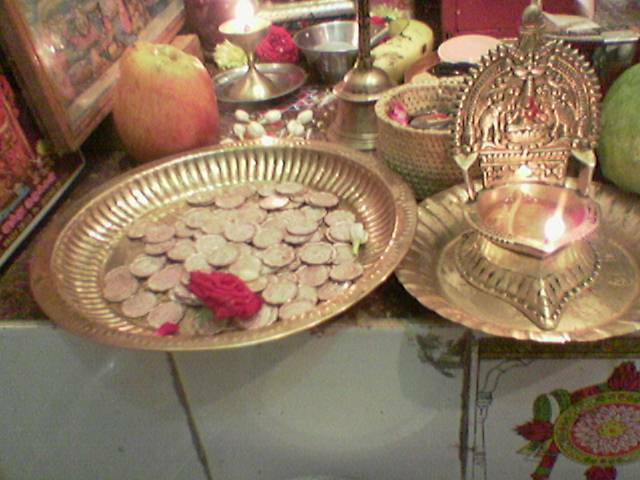 Normally the Archanai is done with coins chanting Kubera Ashtotharam. Coming to preparing Bakshanam for Deepavali, they are less when compared to Gokulashtami. I am not a person who can give recipes for sweets and savories as I don't make them frequently. When it comes to making for festival, yes I do make without missing the tradition. For deepavali the lehyam/marundhu is a must. 'THERATTI PAAL" sweet and a savory will be made a day before and offered to God in the morning of deepaavali. None of those will be tasted till it is offered to God. The Mittai Bandars will be in full swing with variety of sweets of regional fame and the popular joints will offer preparation made with pure ghee. Happy Deepvali to you n your family!! Thanx for dropping by my space n leaving your sweet commenTs..Hope u'll follow me too!! wow...absolutely divine cliks with nice pooja information..!